I am envious. 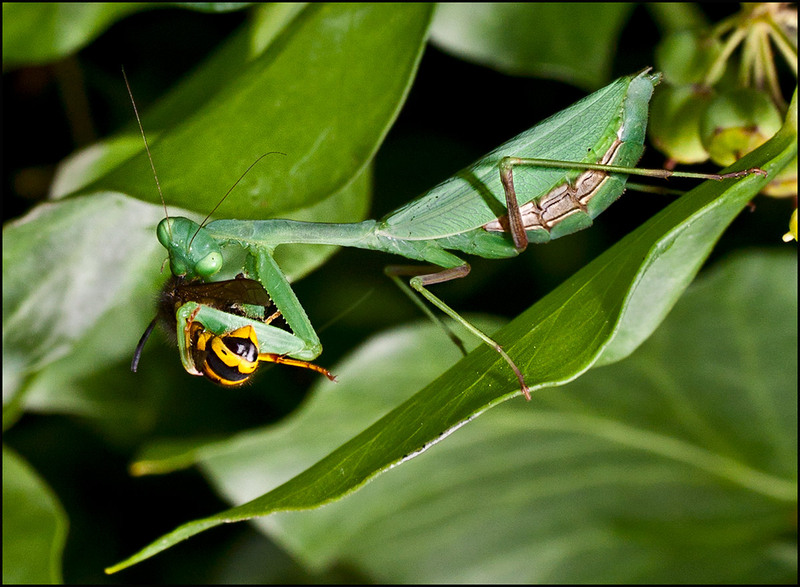 I have only seen a praying mantis in the wild once. And as luck would have it, I had no camera. The yellowjacket makes the photo special. I thought at first that I would have liked to see its head, but on reflection, I think the bright "tail" is better. Overall, the photo is missing just a touch of that "oh wow" factor that could have been there if zoomed in even more. I thought a crop could work, but you lose too much resolution and it becomes a touch noisy at that point. Thanks Lava, this mantis is I believe one of type that is an immigrant from South Africa and quite common around here, I had to put three back outside yesterday. The image quality is about as good as its going to get as I don't have a macro lens and have to make do with the sigma 17-70, which although isn't a true macro lens, gives a fair account for its self I feel. Yes, because the mantis prefers the head and we can't really see how it may be devouring it. It's rather sinister. Nice catch! Were you just right place, right time, or had you been seeking out insects on this particular shoot? Like the others say Pete, wonderful catch. Well composed, can't ask for much more. Yeah it would have been good to capture a bunch of different angles, to tell more of a story, but w/ photography like this you have to take what you can get. Funny, but I always thought a wasp would beat a mantis in a fight. Maybe it was a bushwhacking / surprise attack..